Home More News Deputy Police Chief recognized for "getting things done"
Deputy Police Chief recognized for "getting things done"
SEGUIN, Texas – Deputy Chief Bruce Ure’s is celebrating his two year anniversary with the Seguin Police Department and now he has something new to be proud of – he was selected as the April 2017 Employee of the Month. Nominated by Police Chief Kevin Kelso for a variety of accomplishments that show how Ure is a true “go-getter” and an asset to the department. 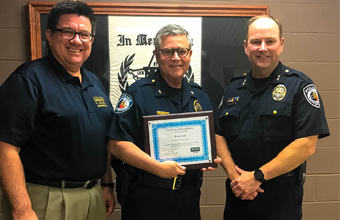 “He has been instrumental within our agency for things like promoting professionalism and leadership, and being an overall ‘go-to’ person,” said Kelso. Ure can be credited with putting SPD on the social media map. His focus on posting a variety of safety information, surveillance videos and community interest stories has led to over 11,000 likes of their Facebook Page! Not only do citizens rely on the page for up-to-the-minute information, the page is also a tool for regional media outlets to source stories that show why Seguin is a safe place to live, work and play. “Social media is traditionally underutilized in law enforcement. We committed our organization to using Facebook and Twitter to help promote what we are doing on a daily basis and most importantly use it to help locate both petty and serious criminals here in Seguin. We also decided to have some fun with our posts whenever possible. We will poke some fun at a crook with the intent of making it a humorous read, which we believe keeps the reader engaged longer. The folks who follow us on FB have identified many, many suspects for us and we are trying to figure out how we ever policed without it,” said Ure. Kelso also commends Ure for his dedication to the new Animal Services Facility opening soon. Not only was he involved with the design of the facility, he has taken a very active role in overseeing construction and hiring for the facility. He also updated the police department’s section of the city’s new website adding more content and relevant information for our citizens.